In many cities and towns across North America people from all walks of life shop in stores bearing the name of St. Vincent de Paul, but how many of them know anything of the man in whose name these shops are maintained? Let me tell you a little about him. Born of a peasant family at Pouy, Gascony, France, in 1580, Vincent was drawn to th e religious early in life and found himself studying at both Dax with the Cordeliers, and Toulouse where he graduated in theology. Ordained in 1600 he remained at Toulouse serving as tutor while continuing his own studies. He spent a brief time at Marseilles and was returning from there in 1605 when Turkish pirates captured him and took him to Tunis in Africa. Vincent de Paul's Muslim captors hustled him ashore where, along with a number of other Christian-born captives, he was marched through the streets for all to see, then they were brought back to the wharf and auctioned off to the highest bidder. The hand of God must have been with Vincent as he was purchased into the household of a kindly Muslim. Impressed with the French priest, the elderly man offered to make Vincent his heir, if Vincent would only convert to Islam. Vincent refused. When the old man died the steadfast priest was sold to a Muslim who was a convert from Christianity. Vincent's life and songs so impressed one of this man's wives that she rebuked her husband for abandoning his faith. Once again it would seem God’s hand was with Vincent as the man returned to the beliefs of his childhood, and subsequently fleeing Africa, took Vincent with him. He was forced to leave his three wives behind, including the one who had sparked his return to faith. Back in France, Vincent impressed the Countess of Joigny, whose husband was general of the prison galleys of France. Before being convoyed aboard the galleys, or when illness compelled them to disembark, the condemned convicts were crowded with leg chains into damp dungeons, their only food being black bread and water; all the while,they were covered with vermin and ulcers. Remembering his own experience as a slave Vincent determined in his heart to reach out to these unfortunates. Assisted by a priest, he began visiting the galley convicts of Paris, speaking kind words to them, doing them every manner of service however repulsive. He thus won their hearts, and converted many of them. A house was purchased where Vincent established a hospital. Soon after this, in 1625, he was appointed by Louis XIII as royal almoner (an officer responsible for distributing alms to the poor) and because of this title gained access to the galleys of Marseilles and Bordeaux, where he met with similar success. At the same time this was happening St.Vincent found himself frequently at the residence of the aforementioned Countess of Joigny, where she persuaded Vincent to preach to her tenants. The result was that so many people came seeking repentance, Vincent had to enlist other priests to assist him in hearing their confessions. This pattern repeated itself a number of times in various locations. In Chatillon-les-Dombes he repaired a ruined church and led another revival among the local aristocrats. With sizable sums of money from these various aristocratic families, who found themselves inspired to good works, various groups and charities sprang up all over France. Vincent himself, founded the Lazarists, a group of priests dedicated to teaching the catechism, peacemaking, charitable works and preaching, especially in France’s rural regions. The Daughters of Charity was established in 1629, when Vincent thought it a good idea to enlist the aid of good young women in the service of the poor. Not long after, the Ladies of Charity, a similar group, was founded, comprised largely of women of nobility. Through Vincent’s teachings and examples, they found themselves working side by side with their own servants in aiding those who were farthest removed from their own positions in French society. Still, Vincent refused to allow himself to be puffed up by his fame and favour. He continued to dress humbly, though appropriately, when attending to the Royal Court. He used his influence among France’s nobility only to improve the condition of prisoners and the poor, establishing hospices, hospitals, kitchens, and refuges wherever he perceived a need. His experience in Tunis never far from his consciousness, he even raised sufficient funds to ransom 1,200 Christians who lived as slaves in North Africa. 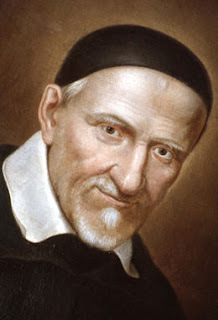 Less than one hundred years after his death Pope Clement XII named Vincent de Paul a saint. In 1885, 225 years after his passing, Pope Leo XIII proclaimed him the patron saint of all charitable societies. This is why you see charity thrift shops named for him throughout Canada and the United States. This master of charity passed away peacefully, sitting in his chair, September 27,1660 - 347 years ago this week. 2. "Vincent De Paul, Saint." Encyclopædia Britannica. 2007. Encyclopædia Britannica Online. 25 Sept. 2007 <http://www.britannica.com/eb/article-9075411>. 3. Various other internet articles derived by searching "Vincent de Paul"
September 22, 1692: The last 8 of 19 condemned witches are hanged by Puritan magistrates in Salem, Massachusetts. The trails began in May of the same year when three young women, their imaginations stimulated by voodoo tales told them by a slave, claimed to have been possessed by the devil at the behest of other women in the village. By the time these last executions were carried out, public opinion on the trails had begun to reverse, and in October authorities would annul the witch trials' convictions and grant indemnities to the families of those who had been executed. September 23, 1857: Layman-turned-evangelist Jeremiah C. Lanphier holds a lunchtime prayer meeting for businessmen on Fulton Street in New York City. At first, no one shows up, but by the program's third week, the 40 participants requested daily meetings. The meeting continued to grow in size until several locations in New York were required to hold everyone. Other cities began similar programs, and a revival—sometimes called "The Third Great Awakening"—catches fire across America. September 24, 1794: Russian Orthodox priest-monk Father Juvenaly, his brother Stephen, and eight other monks after several months trekking 8,000 miles across Russia, Siberia, and the Pacific Ocean arrive at Kodiak Island, Alaska. After two years of ministry, the team had led 12,000 Alaskans to embrace the gospel. Juvenaly then extended his mission to the mainland, where he was martyred in 1796, making him the Orthodox Church's protomartyr (first martyr) of the Americas. September 25, 1534: Pope Clement VII dies. During his tenure Clement was unable to halt Luther's reformation movement or even to implement his own reforms in the Catholic church. When Henry VIII asked Clement VII to annul his marriage with Catherine of Aragon, he refused (albeit rightly in the light of church doctrine) leading to England's break from Catholicism. For these reasons, and others, he is regarded by some as something of a failure as pope, responsible for the destruction of the Catholic (universal) church. September 26, 1861: In the midst of the American Civil War, in accordance with a proclamation issued by President Abraham Lincoln earlier that year, the Northern states observe a day of public humiliation, prayer and fasting "to be observed by the people of the United States with religious solemnities. ... It is peculiarly fit for us to recognize the hand of God in this terrible visitation, and in sorrowful remembrance of our own faults and crimes as a nation and as individuals to humble ourselves before Him, and to pray for His mercy... "
September 28, 929: King Wenceslas, ruler and patron saint of Czechoslovakia is assassinated by his brother and his followers while attending mass. During his brief reign as king Wenceslas sought peace with surrounding nations, reformed the judicial system, and showed particular concern for his country's poor. His example of charity and concern for the less fortunate is heralded in the popular Christmas carol "Good King Wenceslas."